Learn About How Your Eyes Create A Clear Image. Turning Light Into Image: The Retina. 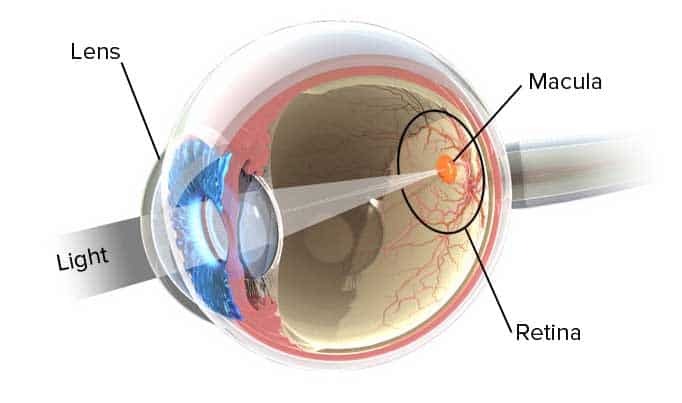 The retina is in the back of your eyeball. 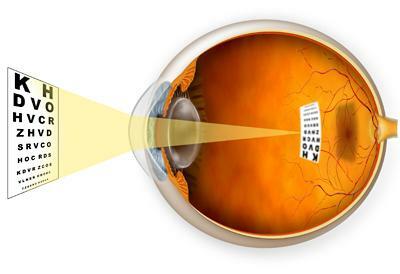 The lens in the front focuses light from far or nearby objects onto the retina. This is where the signal is processed and sent on to the visual cortex in your brain. Creating Sharp Focus: The Ciliary Body. To focus light, your eye uses a flexible lens, and a circular muscle (the ciliary). For distance vision the shape of the lens allows the muscle to be relaxed. When you look up close the ciliary becomes tense to change the lens shape to give you clear close-up vision. Pseudo Myopia: A Muscle Spasm. The eye isn’t designed to be in close-up focus primarily. Eventually the ciliary muscle spasms from too much time tensioned. When it fails to fully relax, the lens can not entirely return to distance focus. This is when your distance vision becomes blurred, often referred to as pseudo myopia or NITM (near-induced transient myopia). Myopia is first pseudo myopia, a focusing muscle spasm, from too much close-up use. Treating Pseudo Myopia: The Lens Approach. Pseudo myopia is a focusing muscle spasm. The lens in your eye is still in close-up mode, because the focusing muscle failed to relax. You are looking at a distance, but your lens is still shaped for close-up. 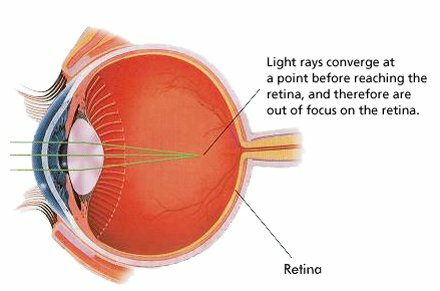 As a result, distant images don’t focus correctly on your retina. Result, blurred distance vision. Glasses and contact lenses move the focal plane further back in your eye, giving you back clear distance vision. Lens Prescriptions Have A Side Effect: Progressive Myopia. Your Eye Adapts To Stimulus. The human eye by design varies the distance from the lens to the retina, by changing in length (commonly referred to as axial change). Most of us are born with eyes “too short”, making us hyperopic as babies (not seeing clearly up-close). Over time the eye adjusts in length, based on environmental stimulus, to give us clear vision at all distances. Note that this is by optical design, the refractive state we mentioned earlier. Our eyes are working as designed, adapting to stimulus. Glasses Are “Grow Longer” Stimulus. Wearing glasses moves the focal plane back further in your eye. While this works in the short term to suppress the myopia symptom, it also creates a stimulus in your eye. Your eye, as designed, is seeking to correct its length according to the new stimulus. Result: Your Eyes Grow Longer. This is what is often referred to as lens-induced or progressive myopia. The Key To Myopia Reversal: Axial Change Goes Both Ways. That’s a huge, core, central point to the whole topic of myopia reversal. 1) The eye is a stimulus response machine. Myopia is simply a refractive state, not a defect, illness, or “error”. And 2), axial change goes both ways, ie. refractive state will change based on input. This is why you find hundreds of detailed improvement reports here, and it’s all substantiated by clinical science. In as little as 60 minutes human eye axial change based on lens use / focal plane change is distinctly observable (absolutely click that last link for conclusive clinical evidence that refractive state is a biological reality, and “genetic incurable myopia” simply is false. Question everything. Especially when those who tell you that you’re somehow a genetic failure and “broken”, also sell you a product to “fix you”. There’s a bit of a conflict of interest there, potentially. Read some of the extensive studies below (as well as lots of other clinical science), mull this all over, come to your own conclusions. With all that said, here’s a quick video I put together to help walk you through the basic starting steps for recovering your 20/20 eyesight. It’s actually quite simple in principle, though in reality you do need to learn a few things about your eyesight and lens use. From here you may want to browse the blog’s how-to guides, diopter discussion, explore improvement reports, and check out our Facebook group and private forum. Time to start getting back to 20/20!